Gerrymandering is a critical concept in civics and government, and as a social studies teacher you may be looking for a gerrymandering game to help teach it. It’s a simple concept to define. It’s the process by which a group of political officials manipulate the drawing of an election map in a way that benefits them. But it’s not such an easy concept to understand. It’s getting a lot of press lately, and it’s back in the courts. The media tries to explain it to the general public, but sometimes I think it’s just become a bogeyman for all that’s wrong with politics. People don’t understand the nuances of what gerrymandering is (and isn’t) – they just blame it for everything they don’t like. Take for example this oft-shared chart from Wonkblog. Yes, it explains some of the concepts related to gerrymandering. But there are two key problems. It vastly oversimplifies, ignoring critical things like geography and population density. It also implies that “perfect representation” is the best option. 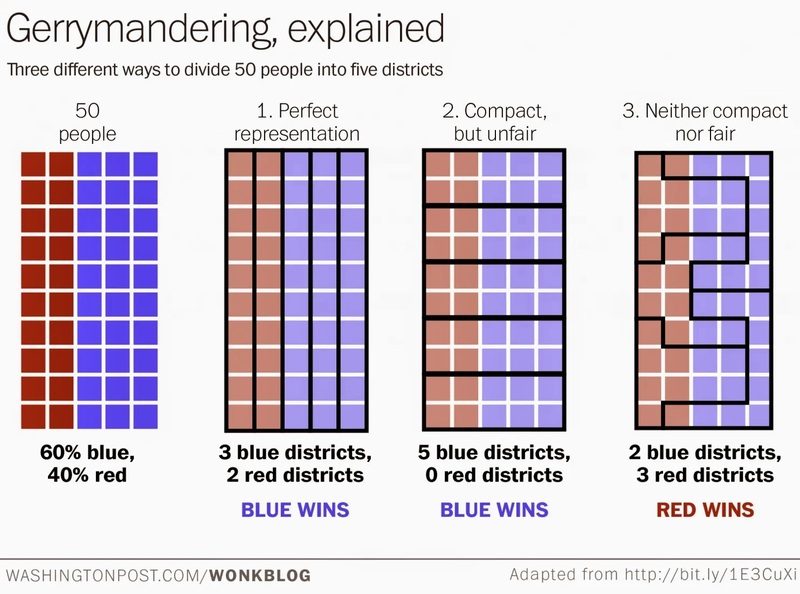 I would suggest that a better way to understand gerrymandering is to actually do it. And to do that, let me introduce you to an amazing little tool… The ReDistricting Game. 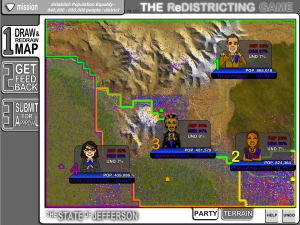 The ReDistricting Game is an authentic simulation of gerrymandering. It creates a scenario – you are the head of a political party in a state. It then gives you a task – draw an election map based on certain requirements. The really cool part is it then generates a map of a hypothetical state with a good level of detail. Hypothetical people are spread across the map. You can see their party identification and their population density. You can see other demographic information like race. Most explanations of gerrymandering rely on abstract sets of colored dots. These are just not realistic, and I wonder how transferrable the lessons are from that to real map-drawing. The beauty of the ReDistricting Game is that you draw a real map and you can see the results in the different districts. The added layer of realism makes it far more authentic, and as a result students who play the game should have a much more concrete understanding of gerrymandering and the redistricting process. When you first start a mission, you’ll be given a set of directions and some information about your state. You get started by making two choices – what political party are you going to play as and what mission are you going to play. Your choice of party doesn’t impact the fundamental nature of the game; it just changes who you’re helping. The mission, however, does have a huge impact. Mission one is simply to create districts of equal size. It’s easy, compared to the others. But it’s a good place to start so that you can understand the mechanics of the game before moving on to more complicated scenarios. Once you make those initial choices, you’ll end up on the opening screen. The chair of your chosen party will given you some background information and some instructions. For example, the goal for the first mission is to “Create Population Equality (640,000 to 650,000 people per district).” That’s your objective. You’ll also see a map of the hypothetical state and tiny icons for each of the incumbent representatives. If you roll over those icons, you’ll learn a little bit about them. Often the information isn’t important, but it can make the game a little more entertaining. The main game screen will show you a map of the state with lots of useful information. When the mission begins, you’ll see a map of the state with some information overlaid on it. You’ll see colorful borders for the existing districts. There is an informational panel for each incumbent representative with stats on his or her district. There’s a little house icon that represents where the incumbent lives. 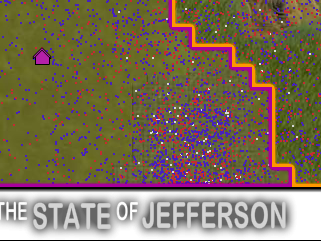 There are also dots on the map representing people. To play the game, you simply click on the map in one district and drag the cursor into another. When you cross over the border, this will push the borders of the first district out. So if you click in the orange district and push out into the green district, it will expand the orange district while shrinking the green one. It’s simple in concept, but it gets more complicated when you progress into the more difficult scenarios. If you hover over one of the incumbents, they’ll give you feedback on how you’re doing. If you hover your mouse cursor over one of the legislators, you’ll get feedback on how you’re doing. Their face is attached to a little info card with important statistics about the current state of their district – the party breakdown and the population. They’ll also give you some feedback about how much they like your plan. When you get into really gerrymandering things, that’ll mean that the incumbents from the opposition party will get pretty upset with you. However, they’ll also get upset if you do something silly like draw their house out of the district. The blue and red dots represent people and population density. The map itself includes important information as well. You’ll notice little red, blue, and gray dots. These represent Republican, Democratic, or undecided voters. The more closely packed they are, the more dense the population is. This is where the game takes on a whole nother level of realism and authenticity. You’re not just dividing up abstract red and blue dots on a game board. You’re dividing up people who live packed into normal configurations – sparsely populated rural areas and densely populated urban centers. When you submit your map, you’ll get immediate feedback on whether or not it’s approved. Once you think you’ve completed the objective of the mission, you’ll submit your map. If you click on “Get Feedback,” you can preview what people will think about this. Once you submit it, you’ll find out whether or not it passes judicial muster. This represents the real process maps go through in order to become adopted. First, you have to satisfy the legislature. Then, you have to satisfy the Governor and get his signature. Finally, you have to survive court battles over the final map. This final piece helps reinforce some of the key concepts surrounding gerrymandering and maps. Your map will often be challenged for compactness. Sometimes it will fail, sometimes it won’t, reflecting the “I know it when I see it” nature of gerrymandering battles. You’ll also often get a challenge for partisan influence, but this is rarely a problem. As in real life, it’s clear that there are partisan influences over the map-making process but the court system rarely uses this as an excuse to invalidate them. The first mission is very simple. It really just teaches you the mechanics of drawing a map. It also teaches you the important fundamental concepts for what makes a map valid – population equality in districts and compactness. The subsequent missions get increasingly more difficult. Each one demonstrates a different form of gerrymandering. 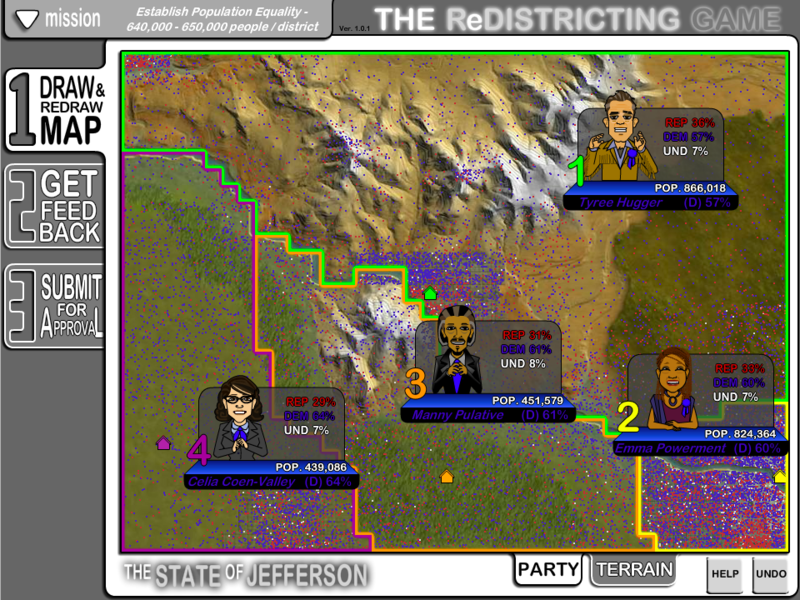 In Mission Two, you complete a partisan gerrymandering. Here, your objective is to redraw the map to help your political party. You deliberately draw the boundaries to maximize the number of districts belonging to one party or the other, creating an imbalance in representation. In Mission Three, you complete a bipartisan gerrymander. This typically gets much less attention than partisan gerrymandering. Here, you conspire with your political opponents to create an evenly balanced map with safe districts. This doesn’t skew the map the same way a partisan gerrymander does, but it creates extremely safe districts for incumbents. 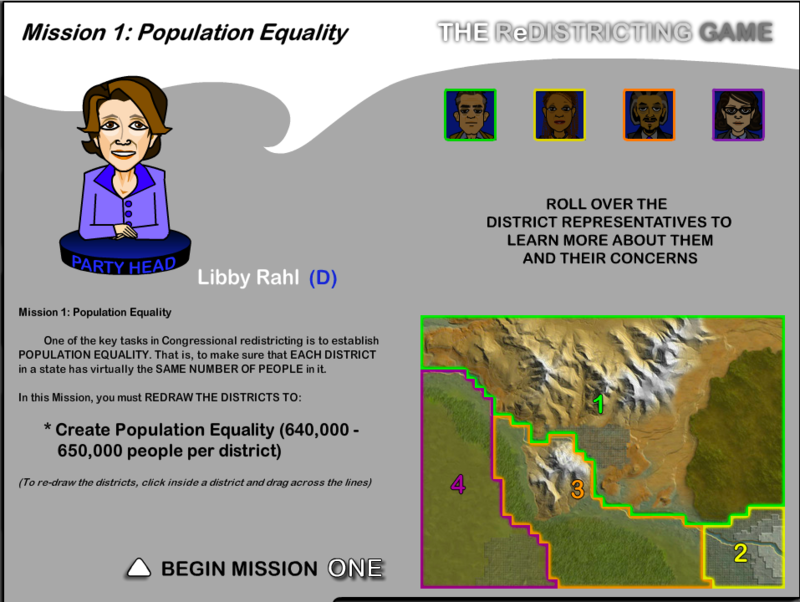 In Mission Four, you complete a gerrymander that ensures an ethnic minority representative. In essence, you’re concentrating enough minority voters into one district to create a majority-minority district that can choose its own representative. This one can be very complicated to complete successfully. In Mission Five, you draw a map based on a reform model. In this case, you don’t know data about people’s political party or race. All you have is population. It helps demonstrate how it’s harder to gerrymander maps in specific ways if you take away that data. This is an amazing tool for teaching gerrymandering, but your next question is probably how to best incorporate this into your social studies class. My suggestion would be to use an “I do, we do, you do” model of gradual release. Introduce the game to your students, project it on a screen, and then demonstrate how to start re-drawing maps. Have students tell you where to move some boundaries to change one of the districts. Then, once you’re confident the students have some semblance of how the game works, release them to work on the first mission by themselves or in partners. If you have sufficient computers at school and sufficient time, you could then take a few days to work on this in class. Or, if you think your students have access to computers at home, you could assign the remaining missions for homework. A good middle ground would be to finish mission two in class and then finish the rest at home. 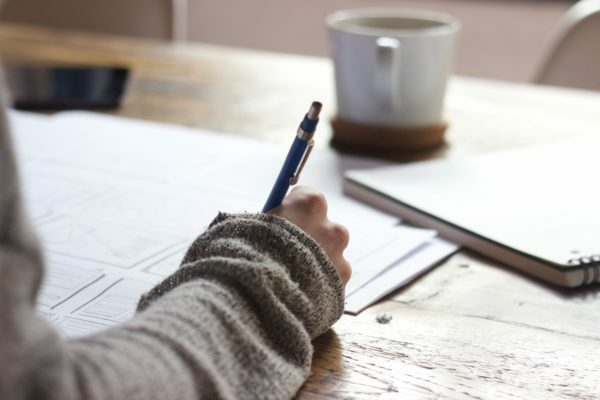 Either way, once the students complete the missions you should have them write a reflection about the process and follow up with a debrief discussion. It would also be wise to preface the activity with some kind of explanation – be it a short reading or powerpoint – about what gerrymandering is. The idea here is that students learn about the concept, they try and put the concept into practice, and then they have an opportunity to reflect on it in writing and in class. Afterwards, you may also want to consider some deeper discussion questions. Does the reform model in the game make sense? At what point is gerrymandering “wrong”? What is a “perfect” way to draw a map? Is there a fair option? While it’s easy to point to extreme examples of gerrymandering and hold them up as problems, it’s a lot harder to answer questions two and three. But What Class Is This For…? This activity does lend itself more to a civics or AP government class, but you should think about incorporating it into your United States history courses. 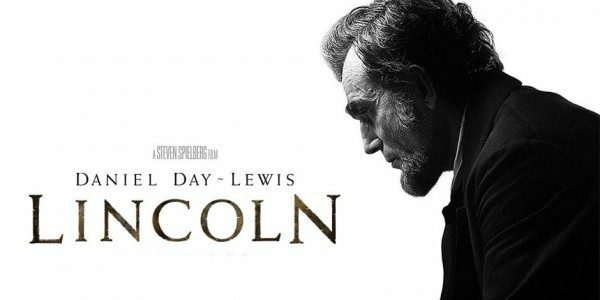 This is a perfect example of something that every student should learn, but there’s no real natural place to put it into a United States history course. Hence the problem with trying to infuse civics in your social studies courses. But give the game a go, and try it out yourself. 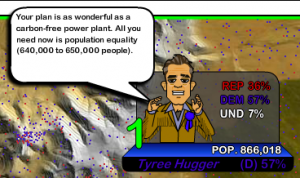 It’s by far the best gerrymandering game that I’ve found. Let me know what you think in the comment section. 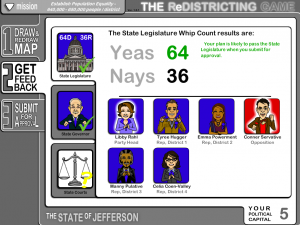 Playing games like the ReDistricting Game can be a great way to make your social studies and civics class more exciting. Here are some other suggestions for how to teach government in a fun way. Previous postWhat Is Project Citizen and How Does It Relate to Civics?